Advertising as a medium has quite evolved from simple announcements about products on flyers to the complex web of promotion spanning multiple media that we have today. We’re all trying to sell something. That thing could be a product, a service or ourselves. Whether it is something we’re trying to sell off or a job we’re trying to get hired for, we are all salespeople in our interactions with people. When you think of it that way, it’s easy to understand why storytelling is such an important part of advertising and why it is starting to become popular. Think back to all the people you like. It’s usually the case that you love the conversations you have with them. You loved their stories. You loved how they made you feel. In much the same way, we find ourselves in love with many of the things that manage to invoke emotions in us; Whether it is a brand that inspires us to feel greater than we already are, a product that makes us feel good about ourselves, or people who make us feel like we’re on top of the world when we’re with them. As a marketer, you would do well to use emotion to market your products. You can never go wrong with it. Figure out the kind of emotion you want to provoke in your audience and go for it. And what better way to bring out emotion than by telling stories? Stories have a way of bringing the most abstract concepts home to us. We use them to teach morals to our kids, to inspire our soldiers, and to get our citizens to vote. Why not use them to sell products and services too? In fact, there is a medium that works perfectly with storytelling: video. A video is capable of combining audio and images in beautiful ways to communicate emotions like no other medium could. For that reason, it’s the perfect way to tell a story. Stories can be an incredibly effective way to market your brand. It’s in our DNA as human beings to engage best with stories, and that is why content marketing is growing ever more popular with time. By using the media of video and audio, the power of storytelling, and its ability to evoke emotions in your audience, you can leave a lasting impression in them. We tend to remember how things made us feel, rather than what they actually were. That is why your message is a lot more likely to leave a lasting impression if it makes your audience laugh, or cry, or feel some type of way, rather than simply convey a marketing message. When you work with storytelling, you create a strong connection with your audience that is likely to remain with them long after your ad is done. 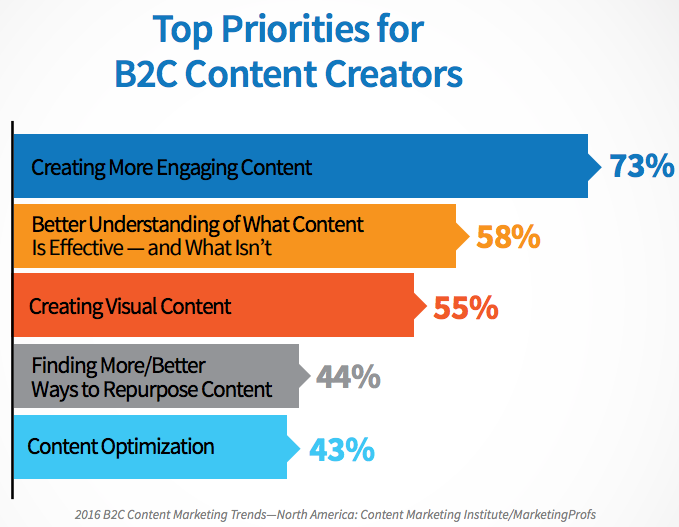 More than a half of marketers are focused on creating visual content that preferably engages target audience. It is a good reason to do the same. When you use storytelling to market your brand, you can more easily create an identity for it and then reinforce that identity in the minds of your audience. The identity that your brand takes on will be determined by the emotional tone of your storytelling, as well as the kind of emotion it evokes in your audiences. Whether you’re looking to go for humorous content or a fun loving personality or something a little more somber, do it enough times and your audience will begin to associate you with it. This is one of the most powerful aspects of storytelling. It will help you to tell the same story in many different ways. You can also do it across different media and platforms. Once you use a television commercial to establish your brand, for example, you can create a continuation video series using the same themes and characters and run a web series on YouTube or some other platform. The very first step, before you come up with your video content, is to think about the message you want to portray. The reason why an emotional story works so well is because the whole point of it is to convey a simple message. You are therefore going to have to refine your message so that it is concise and short. It’s admittedly easier said than done to identify your message. You will have to intimately understand your brand and what it means to your consumers. What is it to them? Does it inspire them to want more? Do they see your products as affordable and convenient? Does it extoll the values of family and togetherness in them? Understanding what motivates your consumers to buy your products is essential to making content with which they can relate to. When people get interesting information, they are likely to share it with their friends. That means that, when you create content that your audience can relate to, you will be likely to reach out to more than just your core audience. One of important things to keep in mind is that your message should be engaging from the first few seconds even without sound. Say you’re a bank and you’re looking to get more customers to open accounts in your bank. You might do it the traditional way, by talking about how stable your bank has been through the years and how your interest rates are competitive. That’s how banks have been doing it all those years, right? Or, alternatively, you can be a little more creative than that. You can tell a story and humanize your bank so the common man can relate to it better. A good example is the video below. The key thing to remember here is that you need to know what motivates your customers when conveying your message. Your market research, for one, should be based in reality and your methodology should have some cynicism at least. Of course, every business wants customers to buy their products because they are great products. However, if your customers come to you because they are crazy about your discounts, then there’s nothing wrong with focusing on that in your ad. For your video content to be successful and get your message across in a way that your audience understands, you’re going to have to convert it into a story. For that to happen, you’re going to have to include two important elements in it: a human element and a narrative structure. The human element is exemplified by the main character of your story, which should be one that your audiences can relate to. Note that that character doesn’t have to be a single protagonist. You can humanize just about anything. In the video below, the future is symbolized by our children and the message still gets across in a beautiful way. The part about the narrative structure is where you tell your story. It is what gets your audience to engage with your video. It doesn’t have to follow a generic fairy tale narrative, but it does have to be a recognizable story, with a question in the beginning and a resolution by the end. The video content should then build the story. You can see some of this in the ad below by Volvo for their V60 Polestar. In the video, the young boy’s imagination is presented, showing something that is a little difficult to interpret at first. However, by the end, we find out that he is thinking about his father’s car. As the audience, we are placed in such a way as to identify with the father of the child. We are being told that it is possible to have a well-performing family car. By showing how effective the V60 is at bringing father and son together, we are creating a strong emotion in our audience that we wouldn’t have been able to create without a story. We exist in a highly competitive market and so it is important that you stand out from the crowd and make your message clear and easy to hear. As you create your video story, there are certain things you should consider. Consumers rarely base their decisions on information. They base them on emotions. However, they will still need some facts to rationalize those emotions with. It can be a bit tricky to find the right balance, but it might help to look at video content from brands that have done it successfully before and learn some lessons. The kind of personality that your brand has will play a great role in the kind of emotions you want to evoke in your audience. Even as you present information about your brand, you should lace it with just the right kind of information, and that means creating the right kind of story. Your industry sector will be an important factor in determining the right amount of balance between information and emotion. For example, a tech product will need a lot more information while a fashion product will need a lot more emotion. Since you will be telling your story to your customer, you need to understand them. Know their likes, dislikes, and the kind of content they consume. There’s no point in being funny when your target consumer prefers something a little more serious and sentimental. Think about the factors that could motivate your target consumers to take interest in your brand. For instance, online content proves to be crucial in driving Millennials loyalty to a brand. Storytelling is a great way to advertise yourself, and it isn’t going out of vogue anytime soon. Use it just the right way and you will take your brand to the next level. Author bio: Serena Dorf is an enthusiastic content writer at EssayOnTime. She is passionate about writing, personal development, psychology, and productivity. In her free time, she is reading classic American literature and learning Swedish. Feel free to connect with her on Twitter.